The Discovery Federation is a group of three schools in Hampshire that work closely with Education Uganda to help improve primary education in Uganda.Here they share ClassPals in action. Each Hampshire school has a link school situated in the Kasese District of western Uganda. They use Oddizzi and ClassPals to communicate with their partner schools on a weekly basis. Located in a rural community, Ibanda, Nkaiga and Kyabikuha primary schools have electricity and internet connections powered by solar panels and generators. The children access Oddizzi through laptops donated by Education Uganda. Schools go online every Friday afternoon to communicate through ClassPals. Small groups of Year 6 children send and receive up to four postcards during each session. Their teacher prints off their postcards and gathers National Curriculum evidence by doing so. Communication through ClassPals gives the children the opportunity to explore the culture of another country and learn through the first-hand exchange of information. 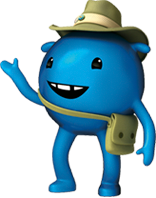 Oddizzi is a one-stop world of learning content made expressly for kids. Enjoy full access to our rich learning resources for 7 days, for free! A 12 month subscription to Oddizzi is £95.00 plus VAT. A subscription covers Y1-6 (ages 5-11) and enables every pupil and teacher in your school to access our resources at school and at home. To place an order please visit our BUY NOW page. If you require more information please contact Oddizzi by clicking on CONTACT US above.